Naturally, some people don’t choose bankruptcy, it may be forced upon them by a creditor seeking to collect their unpaid debt. Regardless of whether a bankruptcy starts by a debtor’s petition or a creditor’s petition, the outcome is always the same: debts are extinguished…just not all debts. This article looks at which common debts are extinguished in a bankruptcy and which are not. Some of the answers might surprise you. Obviously, this article is general in nature and shouldn’t be taken as authoritative advice. If you or your client need specific advice on what debts are extinguished in bankruptcy – please contact us directly. But many people may not know the extent of which debts are covered in bankruptcy. 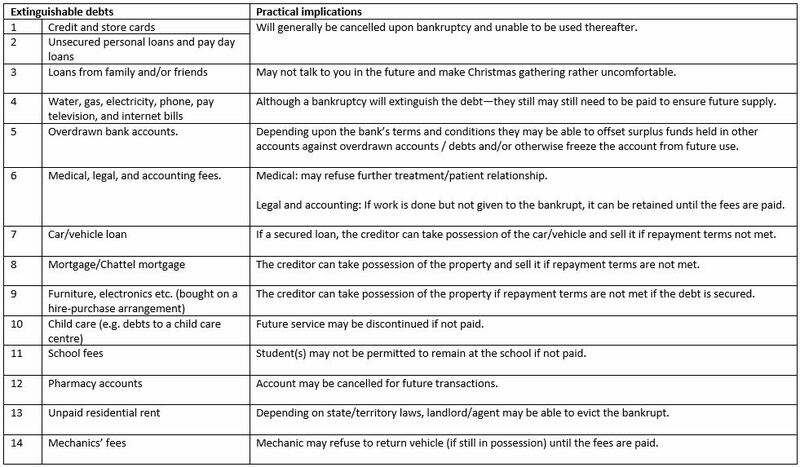 The following table provides examples of the most common debt extinguished in bankruptcy – including some practical issues that may arise despite the bankruptcy covering the debt. As you can see from the list of extinguished debts the effect of bankruptcy can extend to a whole range of debts, which can give people struggling with those debts a very real and fresh start. For clients considering bankruptcy, Worrells has 17 registered bankruptcy trustees ready to talk through individual circumstances and their options to get a solution that fits.